Automatic chokes are for sissies, I installed manual on two previous cars until they went computerised. One piece stoves that don't need priming are the trend. Campfires are for real hikers and outdoorsey people. Cookon Globe Stove. I was surfing YouTube and saw these videos of an interesting idea I have often wondered about, but haven't gotten around to trying yet. This guy is experimenting with simple heat exchangers for the Heineken pot. Thought some of you may not have seen them yet and am curious if any of you had tried this yet. Also, I have been wondering if anyone had ever tried to turn a Hein'ie pot into a low pressure cooker. My first attempt wasn't well prototyped and didn't get a great seal on the lid. I tried to use the original lid with silicon seal, but doesn't fit well. Maybe one of those candy tin lids would work better. I am still looking for better parts, and put it on the shelf. In the meantime I got stuck with an emergency bathroom remodel due to a bad wax seal; So I won't have time to do much with stoves for a while. Just throwing the idea out there if someone else wants to run with it. Of course, it should go without saying that pressurized steam can be very dangerous, so be careful if you do take on this idea. Both are interesting application especially the second video. The bubbles forming at the indentions/exchangers. I'll have to try that to see what's going on. The stove he uses looks good for Heiny pots, anyone seen it before? Thanks for the links, had not seen the videos before. zelph wrote: Both are interesting application especially the second video. The bubbles forming at the indentions/exchangers. I'll have to try that to see what's going on. The stove he uses looks good for Heiny pots, anyone seen it before? I wish we could see the stove by itself. Looks like a simple small can in large can side burner. Like a PMS without the stand or a Fancee Feest without the wick. Nice, controlled burn for a sideburner. I watched the movie again and it was said the Stove is a UniCan stove. I googled the name and came up with two sites. The first was directly related and the second showed how to make a beer bottle stove. I put the beer bottle stove video in the video section. At one time I made my own DIY fly rod and spinning rods. The technique for tying line guides to the rod blanks is one that leaves a smooth no knot finish. 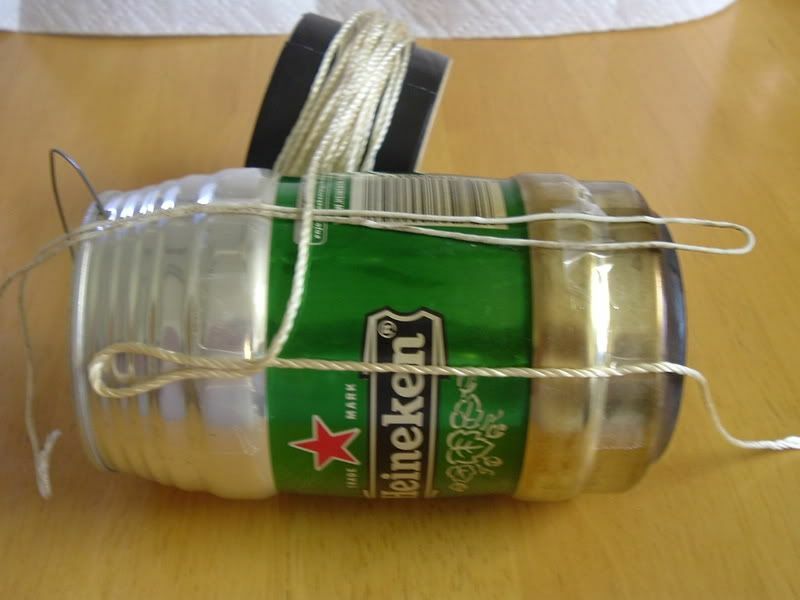 This technique lends itself to attaching fiberglass wick to Heineken pots. I had to make a quick post to get the photos on here. I'll be back tomorrow to rearrange the photos in order of the correct tying sequence. It looks like I'm missing the first start-up photo, bah humbug. It's a handy technique to know. You can wrap the handles on your trekking poles and other things that need a new covering. I rearranged the photos. 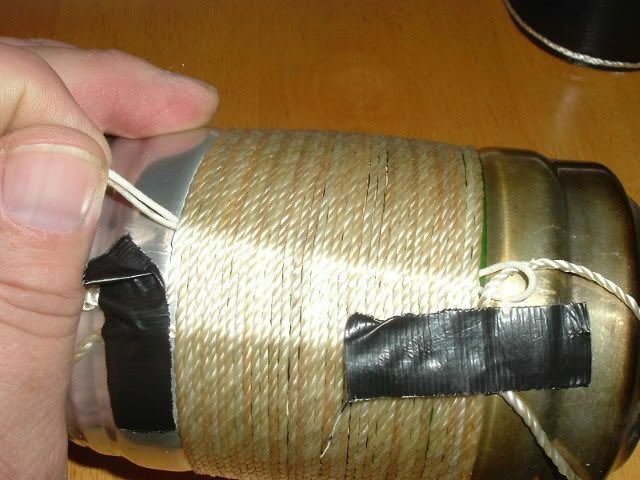 Start out by taping the loops of string and fiberglass wick as shown. I'm using nylon cord because I ran out of wick You tape them so they don't flap in the breeze when you wrap the wick around the pot. They'll get in you way big time. 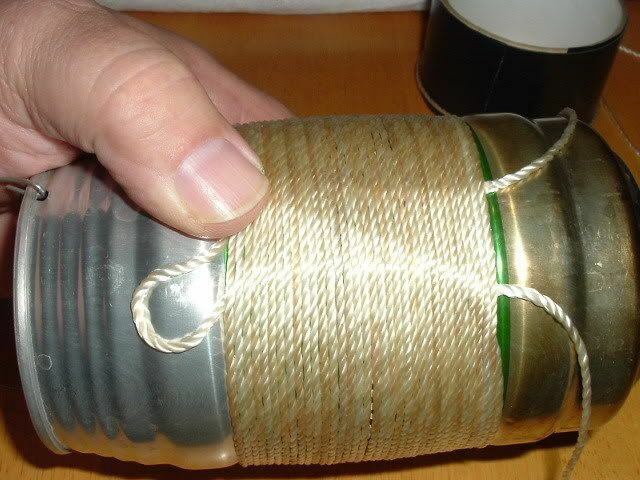 When wrapping is complete, put the end of the wick through the loop formed by the piece of string. Keep your forefinger on the last wrap of wick to keep it tight. 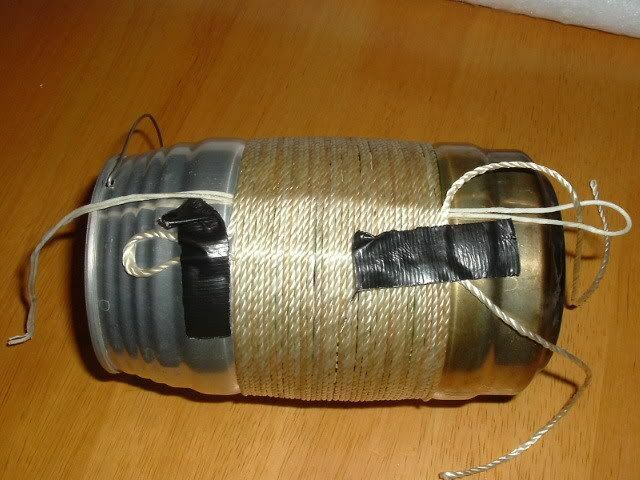 Remove tape and use the tape to hold the last wrap of wick tight to can as shown in next photo. 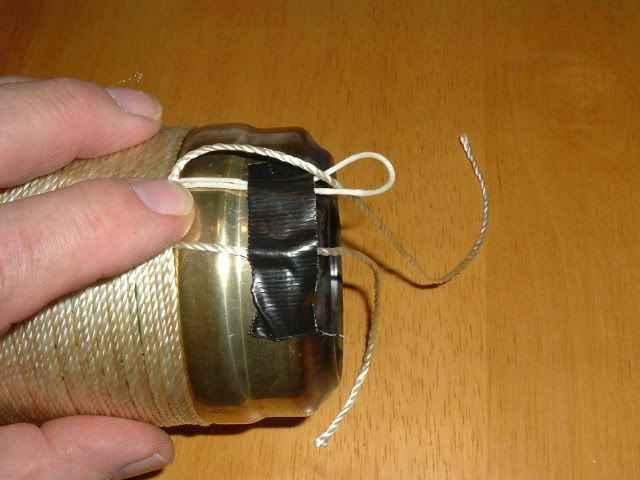 Now remove the tape from the top loop of fiberglass wick at the top of the can(large loop). 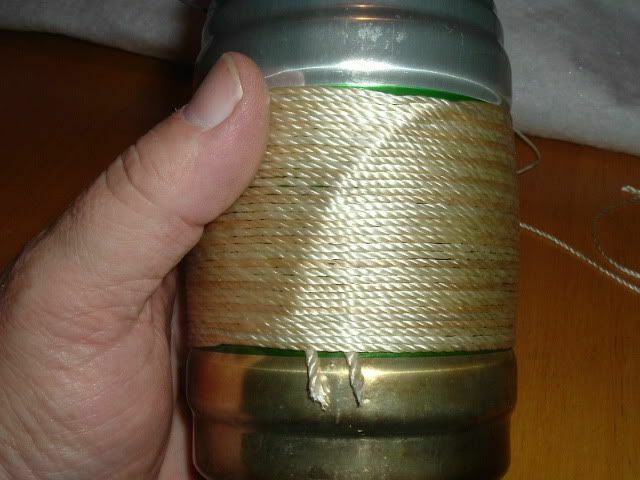 Now grab hold of the fiberglass wick at the bottom of the can and pull it so it brings the loop down under the windings. 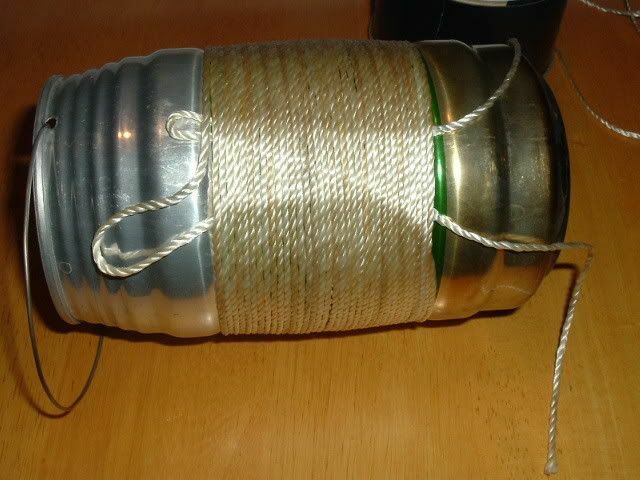 Now grab hold of the string at the top of the can and pull the end of the wick under the wrappings until it comes out to the top where you can then pull the string out. Now grab hold of the wick sticking out at the bottom of the can and pull on it to bring the loop at the top of the can down under the wrappings to secure it. Trim off excess material and tuck under the wrappings as needed. Last step = Using a knife, tuck the ends under the wrappings. Very nice, Zelph. Thanks for the tip. I suppose one could just wrap an inch of the pot to get a fingerhold and save weight. I took Skids advice and just got a pair of inexpensive wool gloves for handling the Heine pot. Plus they are nice to have for gathering and breaking branches and their intended use.